(PhysOrg.com) -- A 20-day expedition aiming to create a virtual 3-D map of the R.M.S. Titanic wreck site is about to leave St. Johns in Newfoundland carrying the latest technologies and dozens of scientists from the Woods Hole Oceanographic Institution in Massachusetts, the National Oceanic and Atmospheric Administration, Waitt Institute, and other scientific institutions. The expected result of the project, named "Expedition Titanic" will be the most precise 3-D images ever recorded of the Titanic site, and a virtual model that everyone will be able to explore. The group will use advanced sonar, robotics, 3-D high resolution/high definition cameras and acoustic imaging technologies to build a three-dimensional map that will eventually be made available online on the already amazing Expedition Titanic website, allowing anyone to explore the wreck from the comfort of home. Woods Hole scientist and director of special operations, David Gallo, said it would be the first archaeological site map of the wreck, and will be the first time a 3-D model has ever been attempted of such a large, irregularly shaped object in such deep water. Previous trips to the wreck site have been mainly for adventure, exploration, or attempts to find and remove artefacts. The Titanic sank on its maiden voyage in April 1912, but the wreck site was only located in 1985 by scientists from the Woods Hole Oceanographic Institution (WHOI), and so far only around half the site (or less) has been fully surveyed. The three by five kilometer (2 x 3 mile) debris field lies in the North Atlantic ocean at a depth of 3.82 km (about 2.4 miles). Salvage rights are owned by Atlanta-based company RMS Titanic Inc., which is funding the 3-D mapping expedition. 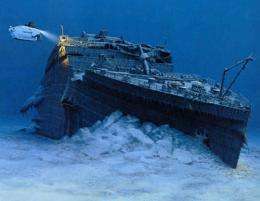 Physically raising the Titanic would probably be cost-prohibitive, and given the fragile nature of the deteriorating ship remnants, would almost certainly be impossible. Expedition Titanic is an effort to "raise" the Titanic in the virtual world instead. Gallo said the expedition would record images of the wreck site using 3-D cameras on remotely operated and autonomous underwater vehicles. Among these will be WHOI's own Remote Environmental Measuring Units (REMUS), which are unmanned vehicles that travel in a set pattern collecting data. Sonar points will be set up at around 30 locations around the bow to take an "acoustic snapshot" at each point. Other goals of the project are to establish a model for the management of shipwrecks in deep water to help in their preservation and to study the deterioration of the Titanic continuing as microbes gradually transform the steel into "rusticles". "establish a model for the management of shipwrecks in deep water to help in their preservation"
How awesome would it be to actually raise it though? I say between very and extremely awesome. Because some objects intrigue humans and are worth preserving for history. Considering it was once the largest of its kind and met such an abrupt demise.